These tips will help you to find the perfect power bank for your phone. More Over, this article will tell you how to choose the best power bank with some basic knowledge about power banks like how it works, and what is the meaning of mAh etc. 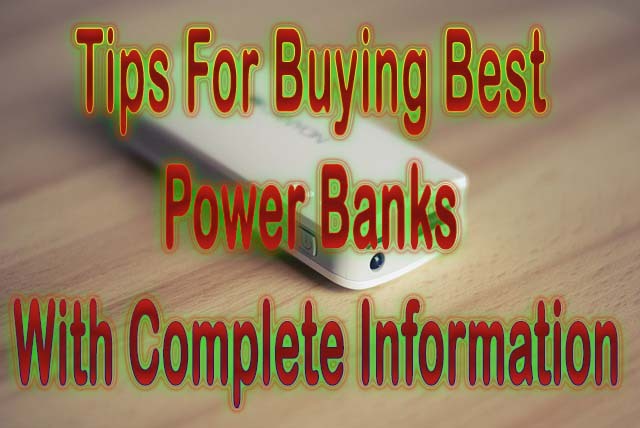 In short, I will try to give the complete knowledge about power bank with some question which everyone has in his mind about power banks. Power Bank is a portable device. It can supply power from its built-in batteries (Rechargeable) through the USB port. Power banks allow us to store the electrical energy and use this energy for recharging our device. In technical words, the power banks contain Lithium Iron or Lithium Polymer Rechargeable batteries installed in a protective case guided by a circuit board to control voltage. How does a power bank work? The working of the power bank is simple. Power Banks has many components such as control circuit, Rechargeable Batteries (Cylindrical or Flat), Thermal Resister on Board (To Monitor the Temperature) and case. The Control Circuit control all the action of power banks such as Charge the batteries, check temperature, control the voltage (Up/Down), to Charge the phone, overcharging, short Circuit and quick charge etc. In other words, the control board is the brain of power banks while the batteries are only used to store the electrical energy in it. All the components are installed in a protective case. The power banks give peak performance after the charge or discharge of 8-9 times. We can not judge its quality by using it only one or two uses. It will start to give stable out after some charge or discharge. 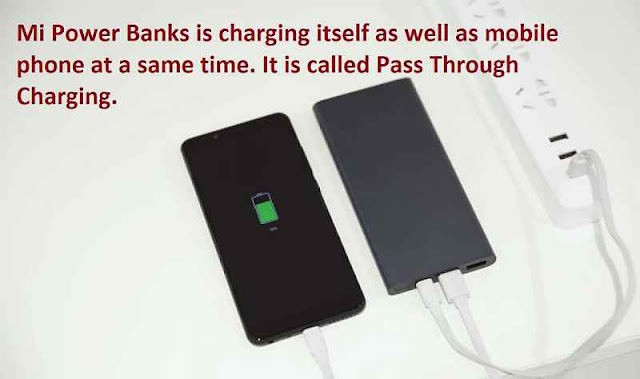 Pass-Through Charging is a great feature of power bank in which a power bank can charge itself as well as the devices connected with it. This feature is very helpful in traveling because we can charge both the phone and power bank at the same time even if our power bank battery is dead. Suppose we are out of the house and do not carry a mobile charger. Then, our phone and power bank both our dead. If our power bank can charge itself only then, we can not charge the phone at that time. But if support pass-through charging then, we can charge the mobile as well as a power bank. This is the major issue which we should give extra care. Power banks have very high capacity batteries which store the energy. So, these should be safe because we carry this device in our pocket and bags. In other words, the power bank should not blast itself or damage your phone due to any reason such as Overcharging, Short Circuit, Over Voltage, Shock Proof, Over Discharge, and Excessive Temperature. The Overcharging, Short Circuit, Over Voltage, and Excessive Temperature are the most common reason which can damage your power bank. So Before buying, please double check the protection which I have mention above. If your power bank has the protection from these 6 reasons then it is very safe to use. Always buy the power bank with more mAh than the phone battery at least double. So that you can easily fully charge your phone. The Capacity of power banks measures in mAh. The power bank mAh meaning is Milliamp Hour. The Milliamp hour figures tell us the amount of power flow that can be supplied by a certain power bank at a specific voltage. In Simple Words, more the mAh of power bank the large the energy in power bank. Today's, The Power banks come with 1500 mAh to 32000 mAh capacity. Suppose your phone battery is 2500 mAh and power bank is of 10000 mAh. Then, it does not mean that power banks will charge the phone 4 times because there is some energy loss in process of transferring the energy to phone. Why there is Energy Loss in Power Bank Charging Process? Because there are two conversions in the process charging the phone with power banks and components of power bank are also consumed some power in their working. First Conversion, the power banks battery voltage is 3.7V. While the Output of USB Port of Power Bank is 5V. So, there is a voltage up-conversion in the Power Banks Battery to USB due to this process some energy has been lost. The Second Conversion, The Mobile Phone’s Batteries are charged at the 4.2V-4.4V. Therefore, there is a voltage down conversion from 5V (Power Bank USB Output) to 4.2V-4.4V (Mobile Battery). Every machine generates heat when it works. The heat is generated in machines when it lost some energy. Similarly, the components of power banks generated heat when they worked and lost the energy of power banks. The power banks provide the efficiency of 75% to 90%(Depends upon company and quality). Here efficiency means how much mAh value it gives after the energy loss. If power bank is efficient at 75% then it will charge to your phones to 2.5 times. How can we calculate the actual mAh value which we get from Our Power Banks? Multiple Output Ports have always advantages such as if one output ports get damage then you can charge the phone with 2nd Output ports. So, Multiple Output Ports saves the money if one port gets damaged or not worked. Another Benefit of Two or more output ports is that we can connect many devices to one power banks at a time. Some power banks have one output ports while others can have two, three or four output ports. It all depends upon your requirements that how many ports are required to you. If some power banks have two ports then check the capacity of those ports. Some power banks give you same power in both ports while some reduce the power in second ports. Many power banks have the potential to charge your phone quickly. If your phone and power bank both supports quick charging then you did not need to connect the phone to the power bank for a long time to charge it. Your Quik Charging Power Bank can charge your phone in 30 minutes. It will save your time. Note 1: Always, charge the device in Airplane mode, because it charges faster than charging on normal mode. In airplane mode, the phone is using only basic features of the phone and the phone battery is not draining out at the same time in other phone applications which runs in the background. Note 2: If you want to quick charging power bank then it should have more ampere output in it. If your power banks support some extra features such as inbuilt Torch in it, Bluetooth speaker, and FM Radio. Then it will be more beneficial for you when you are going on trip or camping. You do not have to pick these extra gadgets with you because the features of these gadgets will be provided by your power banks. Many power banks did not come with connectivity cables. So, a user has to buy connectivity cables for its power banks which put an extra burden on the pockets of users. Therefore, always buy a power bank which comes with cable. The power bank's cable will be more suitable and supportive for your phone and pocket as well. Always check the certification logos because these logo's guaranteed us that the power bank has passed all the standards test and regulation which makes it safe and more efficient. A customer should always prefer to buy high-quality power banks. High-Quality Power Banks supply the electrical energy with right way while low quality does not charge the phone in the right way. In simple words, Low-quality power banks can damage the performance or quality of your costly phone. So, it is my personal advice never comprise with the quality of power banks. Always buy the power bank with warrantee because it gives some sort of money protection to the user if the power bank is not working well or get damaged by any reason. This is another important tip to consider before buying power banks. Do not buying power banks from non-branded companies because these kinds of power banks do not follow the protection standard. So these non-branded power banks may blast. 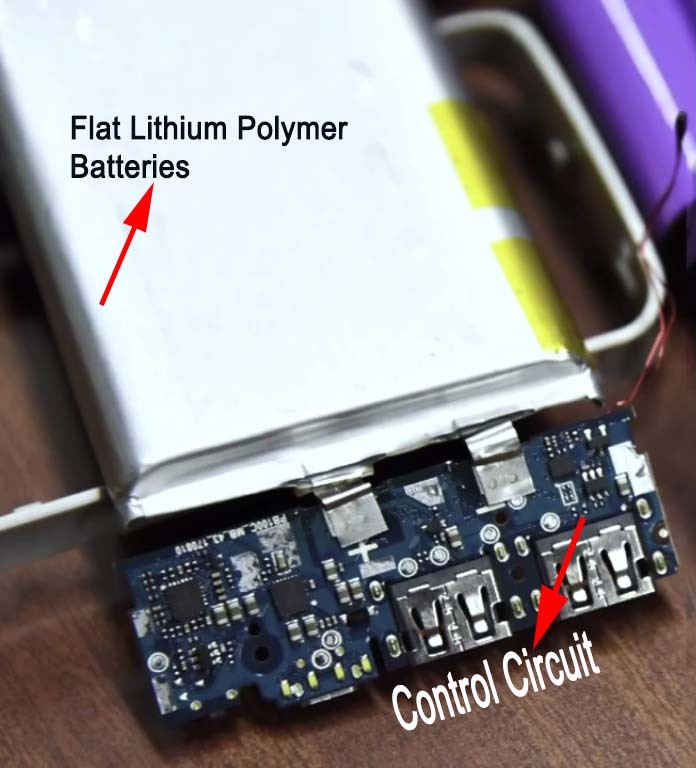 Mostly non-branded power banks have poor control circuit and low-quality batteries or recycled batteries. These non-branded banks are cheap due to low-level circuit and batteries. These are mostly sale by local street vendors. In short, always prefer the branded power banks over non-branded. Always buy good brand Power Bank because of the good controller circuit and battery last longer than non-branded Power Banks. For Longer Life, Buy powerful power bank because it takes a full cycle to charge your phone and the power will last longer. 1. Remove the power banks when it is 100% charge because overcharging or heating may damage the power bank batteries. 2. Do not store power bank constantly in high heat because its capacity can be reduced. So do not put the power bank in Sun Light for a long time. Moreover, do not freeze it in the fridge. Just, put the power bank in the cooler area to get more and more lifetime and capacity from it. 3. Never Charge your phone when both the phone and your power bank is inside the bag. Both devices will generate the heat which will damage both the devices. So, always use the power banks in well-ventilated areas. 4. Take care of the compatibility of the power bank with the phone. If your power bank is not compatible with the phone then it can harm your phone. So, you should ensure the compatibility of power banks with a phone. Tip14 How long does a power Bank Last? It all depends upon the quality, capacity and your usage type of Power Banks. The good quality and capacity Power Banks last longer. Suppose you have 100 mAh phone batter then, your power banks with 2000 mAh to 2500 mAh will constantly charge your phone for 20 hours. The usage time always depends upon the load and how much current you are using from the battery. If you are using power banks to charge more powerful then it will last for a shorter time. Tip15 Which brand is best for My Phone? According to me, There are following brands which give reliable Power Banks to its users. In my opinion, If a user will consider all the points which I mention in this post, then he/she will get good power banks at the end of the day. Please comment below, if you like the article or you have any feedback regarding this article. I am Harpreet Pooni. I am a Tech and Educational Blogger. I did my master in Computer Applications. I love to help the people. My only motive to create this blog to help the people by providing quality content to them. Every Punjabi Should Install This App (i-Hariyali) For Green Punjab. I am Sandeep Pooni. I am a Tech and Educational Blogger. I did my master in Computer Applications. I love to help the people. My only motive to create this blog to help the people by providing quality content to them.